Cardiff City manager Russell Slade lamented his side's 2-2 draw with Rotherham as a missed opportunity to close the gap between themselves and the Championship play-off places. 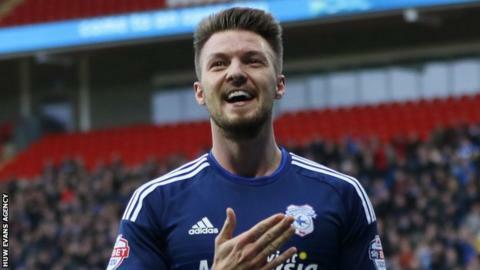 Anthony Pilkington scored two goals for Cardiff and an own goal, but several of his team-mates squandered good chances. As a result, ninth-placed Bluebirds stayed five points off the top six. "Of course, it's frustrating. We've not lost any ground, but it could have been so much better," said Slade. "There are not going to be too many opportunities between now and the end of the season in games like that when you have created the greater chances. "The opposition have not been a fantastic threat. "You can't waste those - that's a problem there. You are not going to be getting too many more of those now." Pilkington's imperfect hat-trick was the main talking point of an eventful match against a team one point and one place above the relegation zone. Republic of Ireland international Pilkington had switched from his customary role on the wing to a roaming attacking position behind lone striker Joe Mason, as he had done for the preceding 3-1 win at Wolves. "I thought it was another excellent performance by Anthony Pilkington and he grabbed another couple of goals," said Slade. "He's played there a bit before, but it was only his second game in that position for me and he's really enjoying it in there. "He is finding pockets of space and was quite inventive. "I thought he was unfortunate with the own goal. There wasn't much he could do." As well as the own goal, the one other blotch on Pilkington's fine display was a second-half booking for what referee Jeremy Simpson deemed a dive in the Rotherham penalty area. "I don't think it was fair call," added Slade. "There was a shout for a penalty, but sometimes the player makes more of it than there is. In our opinion, it could have been given."